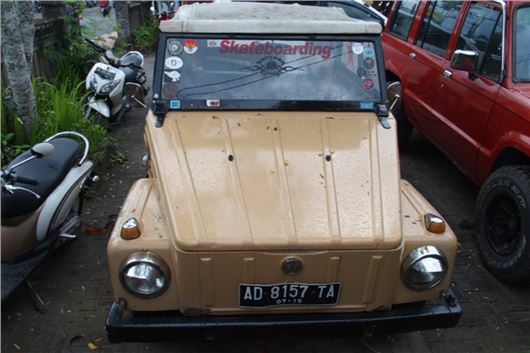 I’m currently carspotting in Indonesia where I’ve found examples of the VW 181 Kubelwagewn and I've also seen new versions of my 1970s Toyota Landcruiser. I drove a 181 ‘Thing’ from Sanur to Singaraja and back in 1981. It had the same idling fault that Edd China fixed on the 181 Mile Brewer bought for ‘Wheeled dealers’. If you mean the Toyota LandCruiser FJ, then that's significant because FJs are currently fetching $30k - $60k at auction in the USA. The LandCruisers you saw may have been the KZJ71 that succeeded the FJ and looked similar. (There was one in the H&H Classic Car Auction at Donington in February). I have a 2010 VW Golf 1.4TSI. It’s a great car, but the heater takes a long time to get hot. About 4 miles before temperature reaches 90 degrees. VW garage says this is ok. All my other cars over the years have done better than this. What do you think? It's a turbocharged engine so the turbo should help. But a well designed engine is now designed to concentrate heat in its cylinder head for more efficient combustion before it releases coolant to the heater matrix. Regarding air or fluid porosity leakage through aluminium alloy wheels or components. A difficulty with aluminium/silicon alloy castings has always existed, in the propensity for the molten aluminium alloy to absorb hydrogen gas during the furnace melting process, which then exhibits in the form of tiny ‘fizzy drink’ gas bubbles in the subsequent solid metal, sometimes causing a leak path through the casting. Today, this is largely prevented by very sophisticated casting design and advanced metal melting and molten metal treatment procedures. It is not economical to try and cure this problem on a single-component basis. Replace the rim, or replace the whole set with a different design. Further, if a car wheel rim has been damaged by an impact, even if it might be repaired by TIG (tungsten inert gas) welding, I would doubt that the repaired rim would be fit for service, because the whole rim may have been weakened by the heating/cooling of the welding, and because the weld itself might also not be air-tight. Many thanks for the technical endorsement. The photo is of our bent 17” wheel that necessitated a change of all four to a more sensible size. My 2013 Jaguar XF Sportsbrake, bought in November 2015, has leather seats but they are not heated, which makes them initially cold to sit on in winter weather. Is it possible to have heated seats retro-fitted? Are the existing seats already “wired up” but not connected? I find it amazing that any vehicle with leather seats can be supplied without heated seats. I suppose these are an extra when initially sold. Any advice will be welcomed. Definitely don't mess about with the existing, because an electric seat is effectively an electric fire in the midst of potentially combustible material. Replacing the seats with heated seats will be expensive, but can be done. My wife’s 2012 VW Up has done 11,000 miles. It had been main dealer serviced and has never given trouble. Then about six weeks ago my wife tried to start it, it wouldn’t start, the engine turned over and “coughed” but wouldn’t fire up. I left it for an hour and tried again, the only way to start it was full throttle, obviously not the best way to start a car from cold. I took the car to a local garage (the main dealer is 40 miles away), the diagnostics indicated “fuel pump control circuit” the garage changed the relay and bingo, everything was perfect. Three weeks later the same thing, back to the local garage and again “fuel pump control circuit”. Have you heard of this problem before? No. Will add to the databank. But if the relay keeps popping then there must be a fault in the system. Maybe the earth to the relay, maybe the fuel tank sender pump, maybe the earth to the fuel tank sender pump. One of those three. I purchased my VW Golf SV 1.6TDI BlueMotion new on 28 February 2015 to use for long holidays as I have just retired. The car went well for 2 months and then error messages started "LOSS IND ERROR", together with tyre pressure faults and alarm signals. The car has now been back to the VW dealer 8 times and once for 2 weeks to try to see the messages appear. They were usually on screen for 5 seconds only, except for the tyre pressure fault, which just stayed on. A wheel bearing has been changed and brake sensors. Last week after I had collected the car, 20 miles later the door locks started clicking open and then shut. The auto braking system indicated a failure and then, on my way back to the garage, the speedo kept dropping back to zero for 10 seconds before returning to speed. I have written to the dealership several times and asked for a full refund as I believe that the car is "not fit for purpose". But at the time of writing they will not consider a full refund or a complete exchange. I also explained that this was my 14th car from the VW Group and that I have no confidence in the car or the dealership or the model. Please advise what my next move should be? You seem to have been unlucky and got a 'bad' example of this otherwise very good car. These are your legal rights against the dealer: /faq/consumer-rights/ But, of course, the value of the car is far more then the Small Claims limit so suing him for a full refund could prove expensive if he refuses to capitulate. I had a 2008 X-Trail, which pulled our caravan very well. I recently changed it for a 15,000 mile 2013/63 model and have been disappointed with how it pulls the caravan. When I discussed it with my local garage they suggested that they could re-map the ECU to give it more power. Do you think that it would make a difference and is it a good idea to do it? If your 2008 X-Trail was a late registered 2001-2007 2.2 diesel then that is entirely understandable because the later 2.0 Renault engined X-Trail had less torque at higher rpm, but was also available with two different power outputs. Yes, the engine management can be re-programmed for more torque at low revs, but that will make the turbo work harder from lower revs and will necessitate always idling the engine for 30 seconds before switching off to lubricate the turbo as it cools down. You will also have to disclose the modification to your insurer who will increase your insurance premium. My Audi TT TDi roadster, built in August 2008 and first registered in April 2009, has only 35,000 miles on the clock. I'm planning to change the cambelt, tensioner, pulleys, etc. based on age, but is it really necessary to change the water pump too? Extremely necessary because these have a reputation for failure and if the pump seizes up it will fling off the timing belt and you can kiss goodbye to your engine. I have driven a Renault Megane estate for the last 14 years but the time has come for a change. My requirements are different and I now need a much smaller car. I test drove the new Honda Jazz in basic spec. and was vey impressed except for what I think must be road noise. There seemed to be a constant "whooshing " sound whilst the vehicle was in motion, but this ceased when the car came to a halt. It was almost as if the air blower/conditioning was on full, however this was not the case. I have never noticed this noise whilst driving the Megane or at least not to the same extent. The test car was on 15" wheels fitted with Michelin energy tyres. (The Meganne has 16" wheels fitted with Primacy HP3). Is this noise peculiar to the Jazz or is it something I will have to live with if I purchase a smaller car on smaller wheels. Also, I went for the Jazz because of Honda’s reputation for reliability. Coming right down the scale, is the Dacia Sandero Stepway worth considering? I have a top budget of £15k plus the tiny bit I might get for the Megane. 15" wheels and tyres are the most comfortable spec for the Jazz that never had great suspension. Shouldn't 'whoosh', but is quite low geared as a manual so engine noise might be what you are hearing. I don;t think you'll beat a Jazz for reliability or for its incredibly practical interior. I own one in Thailand (more powerful engine than UK versions). A Sandero Stepway is a cheap option, Renault Clio based, with Renault engines and drivetrains. I bought a new Skoda Yeti petrol automatic in September 2012 that judders when pulling away at slow speeds, particularly on a corner or uphill and only when the car is warmed up - it often feels as if the gear is too high for the speed. When I mentioned this within the three-year guarantee period the dealer implied that I wasn’t driving it properly and now wants to charge me £90 for a diagnostics test. Have you any idea what could be causing this and would I be better off going to an independent garage? I thought since it’s 7-speed dry clutch DSG it was almost inevitably that the synthetic oil inside this non-maintenance box has become conductive when hot and was affecting the Mechatronics. There had been a worldwide recall for this. But it turned out to be the clutch pack, and the decent dealer swallowed a lot of the replacement cost bringing it down to £387. Twelve years or so ago, I sought, and followed, your advice on the purchase of a smallish car for my wife. Thank you, you were spot on. I now seek to sell that car, but have no idea of its value. It is a Toyota Yaris. T-Spirit 1.3. 5-Door, auto, petrol. 1 Owner, 31k miles, MoT until October, Sunroof, Metallic, rear sensors. Recent tyres, battery and disc pads. I was going to ask you to use our valuation tool: /used-prices/but it doesn't go back that far. As long as there's no rust, this is actually a very desirable car for which there is strong demand and locally I think you can get £1,500 for it, selling privately. A dealer would try to get away with giving you £500, then selling it for £2,000. With ageing VW's it's usually due to the poor quality damp-proof plastic membranes between the door trims and the door frames cracking and disintegrating. Could also be due to blocked bulkhead vent well drains or a broken or misfitted cover over the pollen filter which is very fiddly to refit properly after the pollen filter has been changed. I'm fed up with this. There are three trolls currently plaguing me: Jonathan ‘Larkworthy’; ‘Alan Davies’; And you. I have already answered all of your questions several times. Any further emails from you will be blocked.